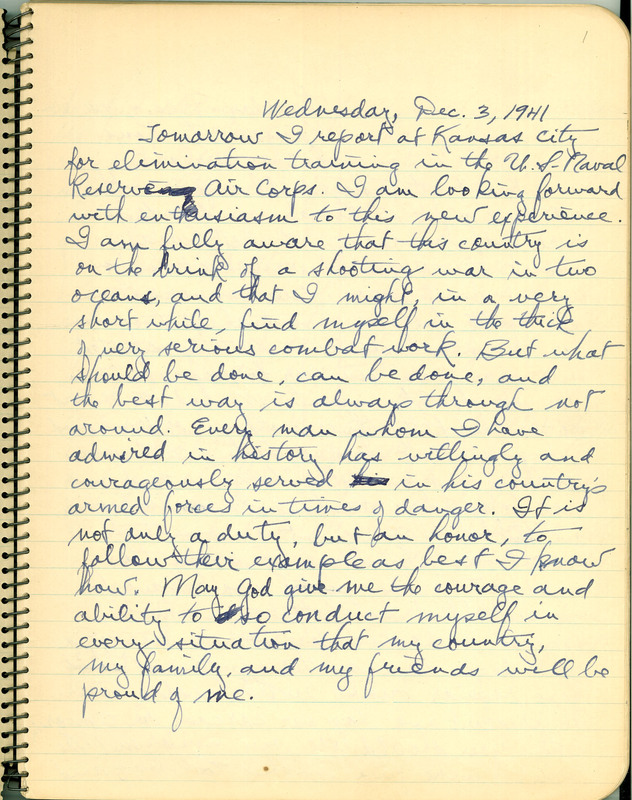 Wednesday, Dec. 3, 1941 Tomorrow I report at Kansas City for elimination training in the U.S. Naval Reserve Air Corps. I am looking forward with enthusiasm to this new experience. I am fully aware that this country is on the brink of a shooting war in two oceans, and that I might, in a very short while, find myself in the thick of very serious combat work. But what should be done, can be done, and the best way is always through not around. Every man whom I have admired in history has willingly and courageously served in his country's armed forces in times of danger. It is not only a duty, but an honor, to follow their example as best I know how. May God give me the courage and ability to so conduct myself in every situation that my country, my family, and my friends will be proud of me.